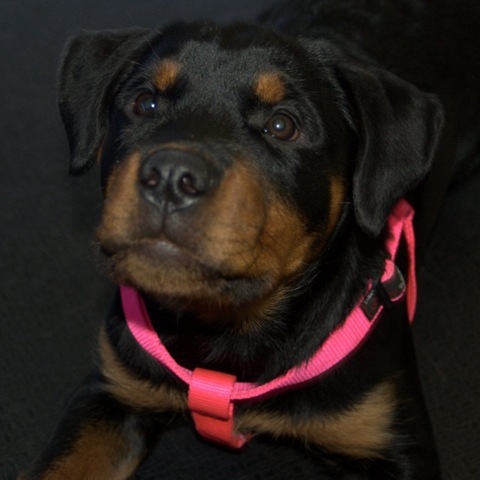 Epic is now big enough for her pink ‘big girl’ harness. I bought this for her about 3-4 weeks ago hoping she could go right into it after the ‘baby’ blue harness but alas we had 2 weeks of no harness. I’m glad this now fits because her puppy collar is also getting small. I was rummaging around the basement today when I came across a stack of foam floor tiles. “These,” I said to myself, “will be perfect for the dogs to play on in the living room”. I have been looking around at rugs/mats but right now the size of our living room makes any kind of temporary carpeting or large rug cost prohibitive and, to be honest, I’d rather not have to deal with anymore carpet in the house between my kluztiness and the dogs. These 2’ foam squares fit together like puzzle pieces and can be arranged to whatever format works for me. They can also be vacuumed and mopped easily in case of canine accidents or human spills. Bear and Epic love their new wrestling ring! After a long, long weekend off (4 days) I am back to work, still bringing both dogs with me because Sean is still away. Epic is teething right now. It seems to go in fits and starts but I know when it is particularly bad because her eyes start watering/dripping. Since her mouth is extra tender, I’m not even going to think about handling her mouth or working on having her show her bite calmly for a week or so. Until then, however, I am going to use the training time after every potty break to shape a free stack. This evening Epic went to her first ‘big dog class’, a class where dogs work on leash, unlike puppy play group. The puppies in this class are 17-24 weeks but Epic and I snuck in a bit early. We got to work on sits downs and stands, basic loose leash walking and then Epic got to play with one of her classmates, Cooper the Cocker Spaniel. Cooper is a bit worried about other dogs but Epic was slow and gentle with him, much different from her usual run right at ‘em play style. I was so pleased to see that she can adjust her play to her playmates. This means she ‘speaks dog relatively well and dogs who ‘speak dog’ well are less likely to get themselves into dog fights. Have I mentioned teething? Epic has lost about 4 of her front teeth (the chiclets, I call them) in the past day. Her gums are red and she is awfully prone to puppy hissy fits in her crate. All I can do is provide her with a variety of things to chew on….right now she seems to prefer bully sticks, rawhides and partially frozen food-filled kongs.